If you're going rambling you need to be aware of how to stay safe. This is particularly true for new ramblers, who aren't always sure of what to expect from their trip. Failing to know how hard you can realistically push yourself is one of the most common reasons why ramblers get injured. 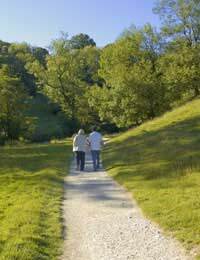 If you're new to rambling, or not sure of your strengths and weaknesses, easy walks are the safest option. These suit ramblers of differing abilities, and usually offer an escape route if problems do occur. Consulting a map (preferably an Ordnance Survey map) before you set off is crucial. If you don't, you're leaving yourself open to potential pitfalls before you even start your walk. Maps can give you a good idea of environment that you'll be facing en route. Anyone familiar with the British weather knows just how quickly a beautiful day can turn sour. Even if it's a warm, sunny day when you leave the house, you should still pack clothes that are suitable for cooler conditions, plus a waterproof jacket in case it rains. You're at risk of developing hypothermia if the temperature suddenly drops, and you don't have adequate protection. Of course, the extra clothing will inevitably weigh you down a bit more, but it might just come in handy! As well as trying to second guess the weather, make sure that you pack enough food and drink. Water is particularly important, as it helps to replace lost fluids. Most rambling experts advise you not to go rambling alone. The reason for this is simple: there's no one to help you out if you get into difficulty. Even the most experienced ramblers can encounter problems from time to time. If you're determined to go it alone, there are certain steps you should take to stay safe. Stick to an uncomplicated route that won't put you in unnecessary danger, and carry a whistle on your person so you can alert others if you have any problems. Common sense tells you to call for help in an emergency, but if you're in a remote area, you might not be able to get a signal. Assuming that this isn't the case for you, it's a good idea to add the phone number for the emergency services to your phone's address book, so that you can reach them as quickly as possible. It's worth pointing out that they won't be happy if they're called out for anything less than a genuine emergency though. If you do have to call them, don't switch your phone off straight after you've ended the call, as they may want to phone you back to clarify details. Rambling (and walking in general) is one of the safest forms of physical activity, and injuries aren't particularly common if you don't take yourself out of your comfort zone. Statistics suggest that a countryside ramble is a lot safer than walking city streets, but that's not to say that you'll never run into difficulties. As long as you're aware of the type of things that you need to consider in terms of staying safe, you'll be in a much better position to deal with them if they arise.